Recent events have drawn international attentiontowards the Kurds, as they effectively confront the Islamic State (IS) both in Syria and Iraq. Their determination is linked to their hope for carving out a nation of their own. However, this also complicates the region even further as the Kurds have a stake, not just in Iraq and Syria, but also in Turkey and Iran; each having a sizable Kurdish population. As Kurdish Peshmerga in Iraq and the People’s Protection Unit (YPG) in Syria, liberate regions they claim historically Kurdish,they increase the concerns of neighboring countries. Turkey clearly has reasons to be concerned. For nearly four decades, Turkey has been trying to quell Kurdistan Workers Party’s (PKK) armed movement that has claimed more than forty thousand lives. Despite early progress, the peace process initiated two years ago reached a dead end as the PKK failed to lay down its arms and theTurkish government failed to implement the expected cultural and political reforms. Interview with SBS Kurdish Radio about press freedom and laws in Australia and Kurdistan. Interviewed by SBS Radio about Newroz Kurdish new year celebration and its significance for the Kurds. 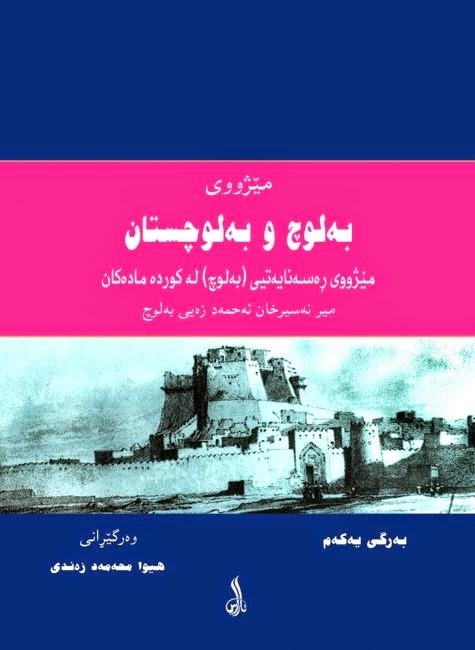 My first book: "History of Baloch and Balochistan - The Origins of Baloches from the Median Kurds" has been translated into Persian. This book consists of two parts: first part includes my research on the origins of Baloches from the Median Kurds. 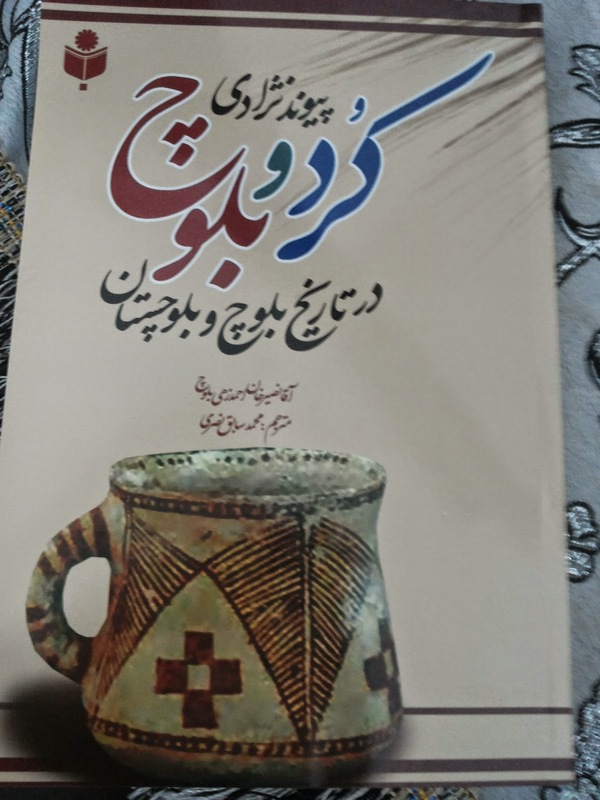 The second part is translation of a book called "History of Baloch and Balochistan" written by the acclaimed Baloch historian and linguist Agha Nasir Khan Ahmadzai Baloch. Australian Government to send further humanitarian aids and military assistance to Kurdistan. The rally was organised by Kurdish community in the wake of Islamic State’s barbaric attack on Kurdistan and its genocide against the Yezidi Kurd religious minority. The rally started from King George Square in the Brisbane city centre and ended in front of the Queensland State Parliament after submitting a letter to Hon Campbell Newman, Premier of Queensland. Later the writer and another rally participant had the honour of meeting with Hon Graham Perrett MP, Federal Parliament member to hand him a petition from the Kurdish community in the Moreton electorate and surrounding areas along with three letters written on behalf of the Kurdish community, including letters to the Prime Minister and Foreign Minister of Australia. Hon Graham Perrett MP promised to the raise the concerns mentioned in the petition in the Federal Parliament and personally deliver the letters. 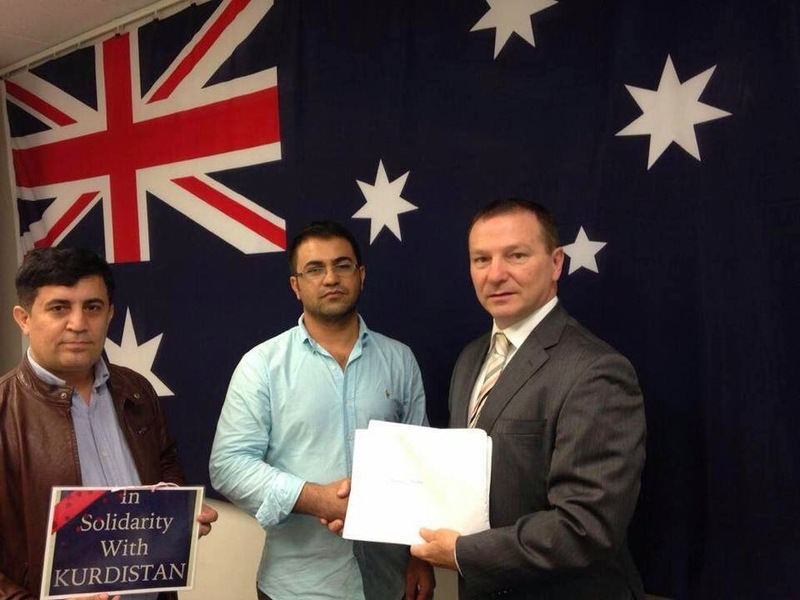 On Wednesday 3 September 2014 Hon Graham Perrett MP made a speech in the Federal Parliament in support the petition and Kurdish community’s rally held in Queensland. I urge the Australian Government to send further humanitarian aids and military assistance to Kurdistan. I also ask the Australian Government to recognise the ISIS barbarism on the people of Kurdistan including the Yezidi, Christian and Shabak religious minorities as acts of war, crime and genocide. The convolution of the Kurdish national political dilemma with the division of Kurdistan amongst Turkey, Iran, Iraq, Syria, Armenia and Azerbaijan had convinced many a reunited independent Kurdistan to be an epic dream. This pessimism was running high during the Cold War era. The States sharing major parts of Kurdish land were divided along the bipolar structure with each receiving sufficient military, political and economic support from their respective polar super powers to crush any Kurdish struggle infused to change the status quo of Kurdistan. The collapse of the bipolar structure varied the political equation fundamentally. Kurdistan is placed with a unique status in the new world order. The prospect of an independent Kurdistan Crescent in light of the current changing political dynamic in the Middle East is becoming an imminent reality. This presentation will look at the unfavourable political, economic and security circumstances that resulted in maintaining the status quo of a divided Kurdistan throughout the Cold War era. The presentation will then look at the political, economic and security changes underway in the post-cold war Middle East and highlight how these changes facilitate the rise of Kurdish political power in the region. For this purpose, the presentation will specifically look at each part of Kurdistan and highlight how an emerging independent Kurdistan Crescent stretching from the Mediterranean Sea to the Persian Gulf could contribute to peace and stability in the region. An Independent Kurdistan – a Buffer Zone for Iran! Iran could be making a strategic mistake for actively opposing the independence of Kurdistan Region! With the ISIS onslaught on Iraq and Kurdish takeover of Kirkuk and other claimed disputed areas, the case for Kurdistan’s separation from Iraq and forming an independent State has grown exponentially to the displeasure of Iran. While Kurds have repeatedly reiterated their right to self-determination before, without attracting any major reaction from the neighbouring countries, this time Iran has reacted fiercely as the independence claim has followed by substantive action. Masoud Barzani, the President of Kurdistan Region, while speaking to CNN last month, stated ‘the time is here’ for self-determination. Few days later, the President went to the Kurdistan Parliament and directed its law makers to commence preparing the groundwork for the holding the referendum on independence. The Iranian government responded with fierce opposition stating that Iran will not allow disintegration of Iraq and formation of an independent Kurdistan on its Western borders. Hossein Amir Abdollahian, the Deputy Foreign Minister for Arab and African Affairs, went even further branding the idea of an independent Kurdistan as an Israeli project to redraw the region’s map. He said, "We will never allow Netanyahu's dreams for Iraq and our region which are aimed at disintegrating the important and sensitive region of West Asia to come true." My interview with SBS Radio (18/04/14) regarding the upcoming Iraqi parliamentary election to be held on 30th April 2014 and Kurdistan Region political parties' impasse and delays in forming the regional government after Regional Parliamentary Election was held on 21 September 2013. Kurdistan Region – Iraq Enters Political Quagmire? Kurdistan Region of Iraq is at the behest of an emerging political crisis as the political tension over forming the new government after the September 2013 parliamentary election is procrastinating. The tension has reached a level that has warranted regional States intervention, complicating the impasse even further. The predicament couldn’t be at a worse timing when much of the region is locked in deep-seated turmoil from Anbar and Fallujah to the borders of Syria, yielding the likelihood of expanding the conflict into the Kurdistan Region. According to a local press, Levin, Peshmarga, the armed forces of the Kurdistan Region, have been put on high alert after al-Qaeda terrorist fighters linked to the Islamic State of Iraq and the Levant entered the predominantly Kurdish region of Khanaqin, a disputed area between the Kurdistan Region and Central Government in Baghdad adjacent to the current administrative borders of the Kurdistan Region. On the surface, the political impasse lingers over the division of important posts of the new government between the two ruling parties, Kurdistan Democratic Party (KDP) and Patriotic Union of Kurdistan (PUK), and the previous opposition parties, in particular Movement of Change (Gorran). This is because the opposition parties have decided to join the new government as no party could win a clear majority to form the government.